Please set Loader Delay to 1 in SimpleIDE Properties (wrench button) -> General Tab. Plug in to the USB port - after a moment you should see the LED blink. Press the "port refresh" button to the right of the drop-down box. You should see a /dev/cu entry if the driver is working. In SimpleIDE v0-8-1, the terminal has a baud rate drop-down box (v0-8-0 does not). Set it to 57600 for the badge. BST is another Mac program you can try if you don't have any luck with SimpleIDE. This did not work for me. I tried two different human badges. I'm running Lion on a late 2011 mbp (usb 2) with the newest simple IDE as of this writing. I ran through the entire list of boards -- which one should we select anyway? If you get a serial port in the port list, click the little monitor button on the far right of the tool bar and it will show the serial terminal. Set the serial terminal baud-rate to 57600. Board types are only used with C/C++ programs - use HUB board type. The SimpleIDE user guide is here. Once I installed the drivers for the serial interface on Mac OS X; Simple IDE is able to see the badge. Thanks! Now that the conference is over will these badges be available for sale? I'm wondering how we can support badge owners who want to use Propeller GCC if we are unable to get badges for testing. I guess Steve probably has one but are more available? Whopis, where can I get your tool to dump the eeprom? I have "bricked" one of my badges by accidentally hitting F11 instead of F10 in the Propeller Tool while writing my first program. I still have a virgin badge and want to dump the eeprom myself and play with it. I tried some other tools but they don't seem to work quite right. Does anyone know why some human badges have an extra chip. Unfortunately I don't have a picture, but I can confirm that some of the human badges had an extra chip in the upper left corner. Any clue as to why that was?? start here: https://gist.github.com/3191267 download the badge utils and follow the instructions. use the virgin.eeprom. PS. A little feedback, you might want to make the ROM and EPROM flashing buttons farther away from each other. Most of the people who came in with bricked badges made the same mistake! You mean F10 & F11. Of course! Yes, this got me several times over the years. Maybe the eeprom burn should be F12. Having toolbar buttons really helps this kind of thing for programming in the dark. I get no serial port in the port list. I didn't yet try the 3rd party driver suggested (http://www.ftdichip.com/Drivers/VCP.htm), but if something like this is required it would be nice to have that in the install procedure. Are there other consequences to installing this generic serial com port driver that I should be at all worried about? Seems like it might be helpful here, but why was this functionality not part of the OS in the first place? Thanks! The user guide describes driver installation on page 14 - looks like a little re-org is in order. Sorry about that. Someone suggested doing the controls over-view first; that pushed getting started out a little .... There is a general download/install page here, but it doesn't mention the driver - we need to fix that. As far as consequences, I've never heard of any. Just remember to set the delay mentioned elsewhere. It seems my Mac Mini came with the FTDI driver pre-installed on OSX Lion - I could be wrong. Linux Debian, Fedora, Mint, Ubuntu all had the driver pre-installed. Even Windows XP SP2 on my VM "just worked" ... not sure about Windows 7. If you go to the first link about the badge (below) there are links to the Parallax IDE, a simple, open source IDE and some source files for it. Happy Hacking! So youve picked up a DEF CON 20 Badge and youd like to start programming it for another purpose. These forums are among the most valuable of all of our resources. Take a look and download some of these before you get started. Perhaps I missed it, but did the top propeller spin file ever get posted? I'm pretty sure I didn't see it after I read all the way through to the end of the thread (70 comments at the time). 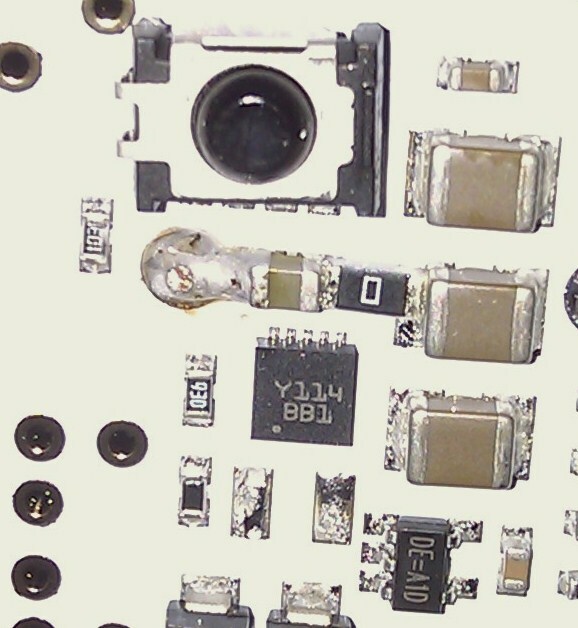 Looks to be Y114BB1 written on the chip, there are also a few other extra components in that area of the board. I have also seen a human badge that had extra components in that area but no chip, so that's at least 3 different layouts. EDIT: Apologies for the poor quality of the attached picture. EDIT2: It's a dc-dc converter chip that I assume was to cope with the battery voltage dropping as the batteries went flat. Guess they decided it wasn't really needed. Welcome to the forums, and the Propeller . I may be a little biased, but IMHO, the Propeller is a darn cool chip. I looked at the original Def Con source code - there is no code in there to drive the VGA port so it will be blank until you load in the example software, or something derived from it. So can you point us to some code/examples on how to drive the VGA on these boards? Thanks! I installed the driver and now I see a port there, but when I go to the terminal and hit the reset button on the badge I just get `fxf~`fffx~fffff`f seemingly independent of the board type I select. Is this to be expected or is it supposed to look like the one on a Windows PC as pictured on this site? Also, I didn't yet read through the whole manual carefully yet, but before I get started messing with things I would like to make a backup of the existing badge if possible -- can this be done? Thanks again for the help getting started. 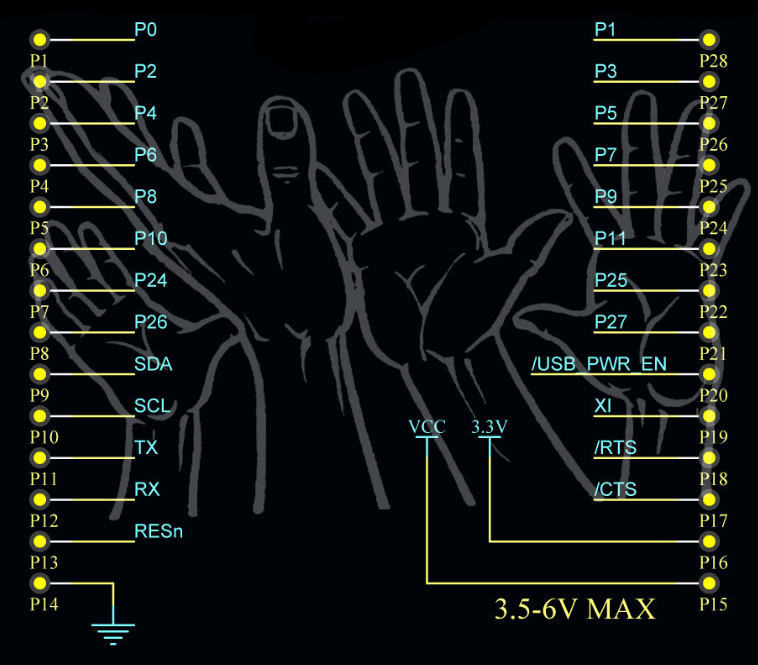 I'm really looking forward to learning this and we may have many applications in our physics lab for these kinds of boards that have faster/easier code. Edit: For those DEFCON badge people (like me) who are here because they are new to the Propeller and would like a good intro to the subject, I found this book "Programming and Customizing the Multicore Propeller Microcontroller : The Official Guide" that looks like it will be a great reference. Thumbing through it and just starting to read it, I can say that it seems well worth it. I got the Kindle version here: http://www.amazon.com/gp/product/B003BZVIZC I have no affiliation with the authors or with Parallax, this is just my recommendation based on personal experience. Is anyone aware of the pin outs at the top of the badges? I have the "cryptic" schematic that was included with the initial Defcon CD and data on the badges. 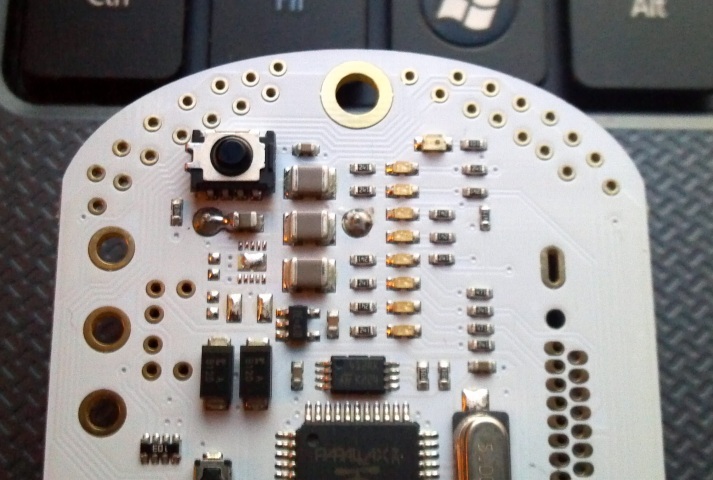 Consequently I can see what the pins do but I can not map them to the physical solder pad pin outs on the badge itself. There are 14 holes on the left (looking at the chip side of the badge) and 14 holes on the right with the lanyard hole (ground) in the middle. 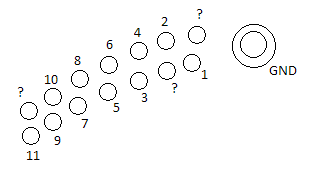 Are P1 - P7 are the top row on the left, and P8 - P14 second row on the left? What about the right? Any ideas? Did you try setting the speed to 57600? I saw similar output when my speed was incorrect. I wasn't able to get the analog accelerometer to work, but I have never worked with one before and really have no idea what I'm doing I'll wait for my second one to arrive. I didn't see any speed setting in Simple IDE -- where can I find that? oh, i'm not sure. I thought you were using the parallax serial terminal that comes with the propeller tool. I'm not sure how to change that in the Simple IDE. You might have to go into your system settings for that com port and set it there. I'm guessing though. We're up to version 0-8-3 for Chinese, Finnish, German, and Portuguese users, but a package is pending more enhancements. Yes, I've attached a diagram that shows the pinout on the badge. I've also uploaded a schematic of the badge on the very first post. I only get a windows executable out of that zip -- is there one for Mac or Linux yet? Thanks. Oops. Sorry. Here's the Mac OSX 64 Version and here's a Debian/Mint/Ubuntu Linux Version. As soon as they give us permission. I spoke to a DEF CON organizer yesterday and he said "as soon as possible". If we have to wait much longer I'll just post it. We figured out early on what the IR was sending to represent each badge (used the badges to figure this out by capturing info and displaying it on the serial). This mode will let me send any badge type (including uber and 1057) or a random badge. There is different led animations for each mode so I can easily determine which mode I was in. Early in the convention we setup a table and had some fun locking up some badges (uber/1057) and helping others get things they were missing. Each badge was easily selectable, more on how later. This mode would display what badge it was receiving so we could tell what others were sending. It was based on the known badge types but would display something different if we picked up something we hadn't seen before. Man those blue LEDs can be BRIGHT. So I put in a brightness mode that is represented by the leds (like a meter) to set the brightness. The modes were selected by watching for a certain free pin go hi. The boards were sensitive enough and there was 3.3v near to an open pen that you could just tap it with you figure and change modes. I tried to solder a couple of switches on but they weren't very reliable. In fact the badge would switch modes on it's own just with wires soldered in. My solder work was fine so nothing was crossed and after I snipped the wires it was fine. I'm not sure what the issue was there, but simply touching the board seemed ot be more reliable anyway. Probably needed some bounce and timed press or something. Didn't mess with it much. Since then I wrote an extremely simple python script to watch CPU utilization and display that on the LEDs through the serial to sit at my desk at work. I hope to mess with the VGA and keyboard stuff soon, just haven't taken the time to do much with it. I'd LOVE to hear what others have done with their badge. We saw some people win the crypto challenge part but I didn't really hear anything about what others had done to their badges. Thanks again for an incredible addition to defcon this year, we appreciate your support! I loved it so much I bought a second at the con. I collect the con badges and would love any badges people don't want that are something other than human. I've noticed this post for the last couple of days. It seems like you have totally grasped many concepts in a short time. Congrats for that! Glad you enjoyed it so much. Looking forward to your VGA efforts.